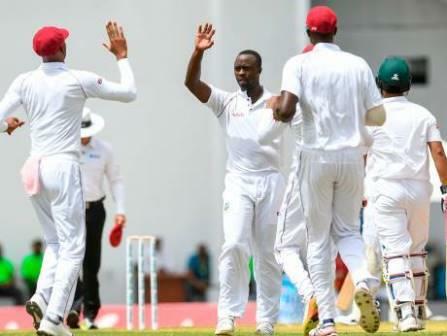 North Sound, Antigua: Kemar Roach led the demolition of Bangladesh with a five-wicket haul as the tourists were dismissed for 43, their lowest total ever in Test cricket, before lunch on the opening day of the first Test against the West Indies at the Sir Vivian Richards Stadium in Antigua on Wednesday. By stumps the West Indies top-order had built on that dominant bowling effort in reaching 201 for two, a lead already of 158 runs with eight wickets in hand. Opening batsman Kraigg Brathwaite played his usual sheet-anchor role to perfection in compiling an unbeaten 88 from almost five hours at the crease. He put on 113 for the first wicket with Devon Smith (58), while Kieran Powell stroked his way to 48 in an 81-run stand before falling just before the close of play. Their serene progress through two sessions contrasted sharply with Bangladesh’s woeful batting performance. Apart from being their lowest Test innings total and lowest for any team in Test cricket in the Caribbean, it was also the second shortest first innings of a Test match — 18.4 overs — in the game’s 141-year history, bettering by just one delivery Australia’s dismissal for 60 off 18.3 overs by England at Nottingham in 2015. Put in to bat on the greenest surface seen in 10 years of Test cricket at the venue, the Bangladeshis were no match for the quality of the West Indies fast bowling led by Roach, who set the rout in motion by claiming the first five wickets for eight runs in the space of 12 deliveries despite appearing to be troubled by a muscular strain behind his right knee. However it was the visiting batsmen who felt the greatest discomfort with only opener Liton Das getting into double-figures in a performance that once again exposed the vulnerability of their players in conditions away from what they are generally familiar with on the Indian sub-continent. Das was sixth out for 25, an ugly heave offering a simple catch to Roston Chase at backward point off Miguel Cummins to end any prospect of Roach claiming all ten wickets in the innings. Bangladesh’s bowlers were made to look pedestrian in the conditions and their plight was worsened by chances put down off both Smith and Brathwaite. Yet there was delight on an otherwise forgettable first day of Test cricket for Abu Jayed when he had Smith caught at the wicket to claim his maiden Test success. Mahmudullah was the other wicket-taker, removing Powell to a deflected slip catch 15 minutes before stumps.